The face of the modern-day workplace has undergone massive change over the last decade. No longer is the office a dwelling place for employees serving a 9-5 next to corded landlines, fax machines and bulky desktop computers with dial up internet connections. The office space has undergone drastic evolution with the emergence of newer technologies, materials and a shift of priorities for organisations and employees alike. 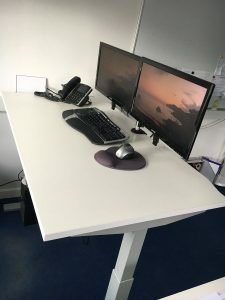 The intervention of workplace wellness initiatives (Department for Work and Pensions 2017) designed to combat increased workplace illness has highlighted opportunity for the introduction of revolutionary furnishings such as electric sit stand desks, (desks allowing you to adjust from standing and sitting), replacements of sugar to sweeteners and use of exercise balls. We predict this will continue to be a focal point in 2019 as the drive to make Britain healthier continues. Thanks to the introduction of laptops, cloud and mobile phone technology. Technology allows the workforce to work wherever they are without being stuck behind a desk. Because of this, we predict 2019 will be the trending year of space prioritisation within the office environment. Allowing for designated remote working zones and communal areas for team-based collaboration. Millennials are predicted to make up half of the workforce by 2020 (Jansen 2016). With this emerging demographic comes a different set of priorities from their predecessors, changing the face of office design both physically and aesthetically. This trend is steadily gaining traction as the lines between home comforts and the workplace become more blurred with an increasing workplace demographic, and shows no signs of slowing down in 2019. The recent enforcement of General Data Protection Regulation (GDPR) has observed a significant change in the way employers and organisations store and keep sensitive data. Gone are the days of keeping contact information visible on desks and post-it notes stuck on computers, and rightly so. GDPR has stimulated the necessary implementation of safely securing data in appropriate folders and locations carefully considered by employers to ensure they are safely stored in easy to access, space saving locations. Finally, we’ve noted the emerging trend of the breaking down of divisional walls between the workforce within the office environment. The transition from segmented individual work stations to more open plan office areas endeavours to develop an increased sense of community, collaboration and reinforce social relationships. Allowing for increased emotional and social wellbeing for the workforce within the office (Belosic 2018). We’re observing traditional brick and mortar walls being replaced with smaller dividers, constructed from natural materials like bamboo walls with shrubbery, metal display cabinets and acoustic panels. As shown from the above list, office design is undergoing significant change now and in the future. These trends are becoming more prevalent as key demographics (millennials) continue to grow and prioritise different requirements from the organisations they work for. Responding to and meeting the increasing demand of this workforce, (existing and emerging) allows employers to improve their employer perception. As well as increase the acquisition and retention of top emerging talent within and for their organisations.